A patent allows the holder to exclude anyone else from making, using or selling the 'invention' for up to 20 years although this can be extended by clever manoeuvring for up to 30 years. Since 1980, patents have been increasingly extended to include living organisms, their organs or body parts, and their genes. Some countries - particularly those in the developing world - are resisting such moves but, citing free trade rules, the US and industry are pushing for all countries to allow patents to be granted on genes and living organisms. involving unsuspecting parties in extensive and costly legal battles. 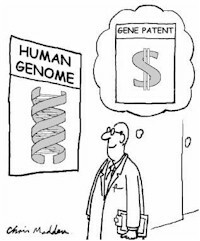 In 2010 a US federal judge struck down a several patents on human genes. Read the New York Times article and the US court's decision on Myriad's patents for the breast cancer predisposition genes BRCA1/2. Myriad appealed against this decision and there are ongoing court cases in the US. Based on research specially commissioned from GeneWatch UK. The 12-page supplement provides an in depth analysis of the race to patent the genes of humans, animals and plants. It includes details of which companies have patented what genes, articles on the implications of gene patenting and a Beginner's Guide to Gene Patents.